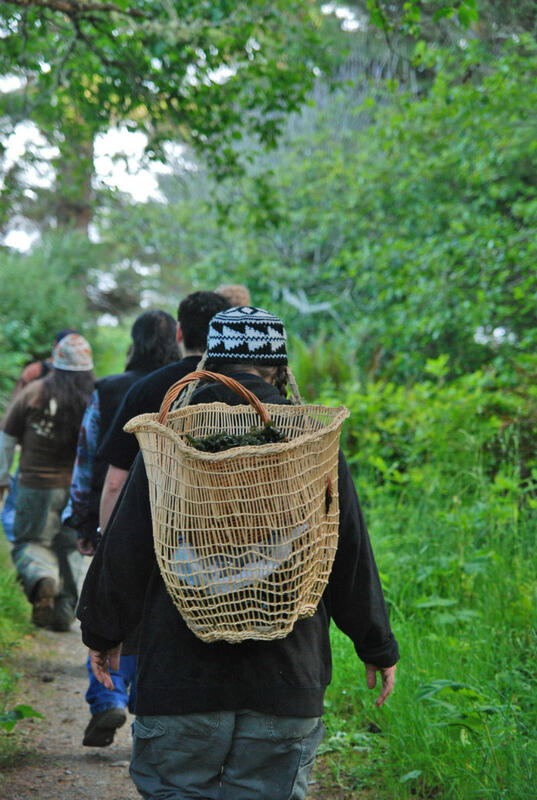 Citizens from the Yurok, Hoopa, Karuk and other Indigenous Nations came together last week to gather seaweed, mussels and clams along California’s North Coast. If the state of California pushes through its proposed MLPA Initiative, the customary practice of gathering these and other subsistence resources would be outlawed. Members of the Yurok, Hoopa Valley, Karuk and other Tribes on Saturday, June 18 gathered seaweed, mussels and clams at three beaches on the North Coast to protest proposed restrictions on coastal gathering proposed under the Marine Life Protection Act (MLPA) Initiative. The Tribal members, organized by the grassroots Klamath and Coastal Justice Coalitions, gathered at Patrick’s Point State Park at 5:30 am, Clam Beach at 7:30 am and Wilson Creek Beach near Klamath at 8:30 am. She said no park rangers interfered with the harvesting of coastal resources by Tribal members at Patrick’s Point, as rangers have done in the past. She pointed out the hypocrisy of the MLPA’s “marine protected areas” outlawing tribal gathering and fishing, while doing nothing to stop ocean industrialists from destroying the marine ecosystem. “It is our sovereign and sacred right to harvest coastal resources according to our customs. We will no longer allow the state or the feds to criminalize our culture. They will have to acknowledge that we are part of the ecosystem,” added Colegrove. Bob McConnell, Yurok Tribal Heritage Preservation Officer, said coastal tribes harvest from the ocean for their ceremonies and physical health. McConnell said decades have passed and public perceptions about Native Americans have changed since most of the rules that govern California’s coast were signed into law. “These government bodies have made criminals out of people for embracing their culture. It is time to decriminalize our culture. We want the people of California to know that and join us in the process of reversing it,” McConnell concluded. Local Tribes use hundreds of coastal resources for ceremonial regalia, medicine and for subsistence, according to Colegrove. Under the proposed Marine Life Protection Act marine protected areas, tribal citizens face fines and potential incarceration for harvesting for traditional purposes in a culturally appropriate way. Regulations against indigenous people in state parks, federal marine reserves and the proposed MLPA marine protected areas are an “unacceptable and outdated threat to native sovereignty and culture,” she stated. Representatives of the Yurok Tribe and other tribes have met with John Laird, Secretary of the California Natural Resources Agency, regarding tribal gathering under the MLPA, but the state has to date failed to address tribal fishing and gathering rights. The California Fish & Game Commission (CFGC) will meet in Stockton on June 29-30 to discuss and adopt the amended unified proposal for marine protected areas on the North Coast. The MLPA Blue Ribbon Task Force and the Regional Stakeholders Group both recommended allowing traditional tribal fishing and gathering to continue in North Coast marine protected areas (MPAs), but the unified proposal has been altered in a number of areas, to the chagrin of Tribes, fishermen and environmentalists. Colegrove said that tribal members will show in force at the Fish and Game Commission meeting to defend their sovereign rights that they consider to be under attack by the MLPA Initiative. The Klamath and Coastal Justice Coalitions are native alliances formed with the aim of protecting tribal rights. The KJC played a large role in pushing forward the removal of four dams on the Klamath River and is currently working to ensure California’s Marine Life Protection Act honors tribal sovereignty. The MLPA Initiative operated through a controversial private/public “partnership funded by the shadowy Resources Legacy Fund Foundation. The Schwarzenegger administration, under intense criticism by grassroots environmentalists, fishermen and Tribal members, authorized the implementation of marine protected areas under the initiative through a Memorandum of Understanding (MOU) between the foundation and the California Department of Fish and Game (DFG). MLPA and state officials refused to appoint any tribal scientists to the MLPA Science Advisory Team (SAT), in spite of the fact that the Yurok Tribe alone has a Natural Resources Department with over 70 staff members, including many scientists. The MLPA Blue Ribbon Task Force also didn’t include any tribal representatives until 2010 when one was finally appointed to the panel. For more information on the MLPA Initiative and protecting tribal rights, go to: http://www.klamathjustice.blogspot.com.